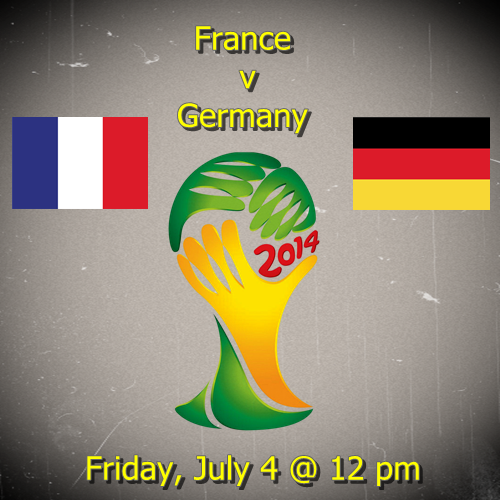 This Friday, July 4 features two of the four quarterfinal matches for the 2014 World Cup and starts with the 12:00 noon game between France vs Germany. Both European teams topped their respective groups and each finished with 7 points from their three group stage matches. In doing so, France looked quite spectacular at times including their 5-2 win over Switzerland. They looked just as impressive in their round of 16 match against Nigeria and were able to control the match throughout the entirety of the 90 minutes. The fact that theirs was a match that went just the 90 minutes and did not require extra time or penalties should say plenty for how they played. There were still moments when they did not play well and they really should have done better and closed out the match sooner than they did. Germany looked dominant in their flying 4-0 win over a 10-man Portugal in their opening match. Since then, they have looked beatable. Despite this, they have managed to win when they need to. Their 120 minutes against a resolute Algeria was certainly draining, but also exposed many of their weaknesses. Algeria pressed them hard and their quick counter attacks left Germany’s back line of 3 center backs exposed time and time again. If not for a combination of Manuel Neuer and Algeria’s poor finishing, this match would have ended at 90 minutes and Germany would have been going home. This match is going to be a good one. Germany often play slowly and methodical by dominating possession and using passing and movement to work their way into the area. They often get the ball out wide and look to get it into the box or hit a runner coming in late. France, on the other hand, have a more dynamic strategy and never rely too heavily on one particular style. Up front they have two powerful forwards in Karim Benzema and Olivier Giroud, the question becomes whether they can play together or if only one will be played. Their attacks are varied between any number of styles, but knowing the weakness in Germany’s back line, they will likely be very direct and use the speed of their midfield and attacking line to wreak havoc. Both teams have very strong, talented midfielders, but France does have the better attacking line. Thomas Mueller is a very good attacking player, but Karim Benzema and Olivier Giroud are the better options for strikers. This could be the difference between these two teams. My prediction is that this match will be close and will most likely go into extra time and even as far as penalties. I’m predicting a full time draw with both teams scoring, but with France winning it in extra time. I do believe that if this match goes to penalty kicks, that Germany will prevail and advance. I would also say that France is more likely to win this in full time.